Martin Li 5d of Sweden swept the 2010 Nordic Go Championship 6-0, held this year in Oslo from April 2-4. Local hero Jostein Flood 4d lost only to Li, for the silver crown. Xia Jie Lin 5d, also from the Norwegian capital won bronze on sos. In Oslo 33 took part. Click here for complete results. Dai Junfu 7d (r) of Lyon won the Paris Open in Antony, April 3-5, undefeated 6-0. Csaba Mero 6d of Hungary lost only to Dai to finish for silver. Favorite Hwang In-Seong 8d had to settle for bronze on sos. Also with four wins: French Championne Yanqi Zhang 6d, Christian Pop 7d (Romania) and Pal Balogh 6d (Hungary). The latter won the overall classement of the Pandanet season this year. The field was very strong, like last week’s Shusaku Cup in Romania and attendance was similarly high: 224 took part. Between rounds, Dai autographed copies of his new book on the middle game. Click here for the full results. If you know them, following joseki is easy, but what happens when your opponent veers off course? Will you know how to handle it? Alexander Dinerchtein 3P has teamed up with Josekipedia to offer a joseki contest exploring this problem. 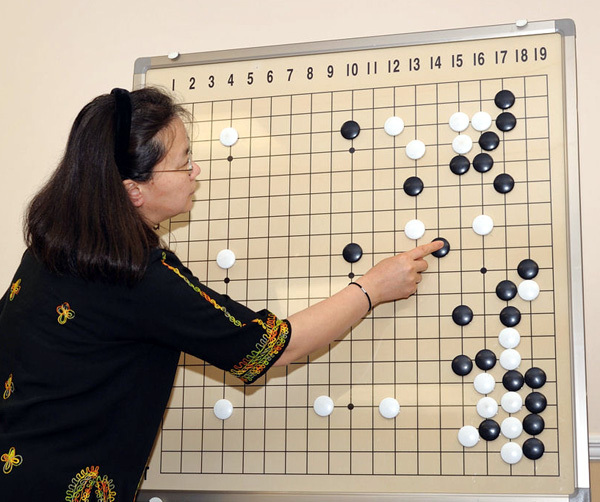 The contest contains three real high-level games containing joseki mistakes. “Find the mistakes, then the best refutations, and win fabulous prizes,” says Dinerchtein. “Even if you are not a joseki expert, you will learn a lot from participating in this contest!” The contest ends April 30. Kang Dongyun 9P defeated Choi Cheolhan (Maxim Cup) by resignation in the second round of the 11th Maxim Cup title match on April 5. The series is now tied 1-1 with the third and final round to be played on April 6th. Twenty students ranging from 10-kyu to 5-dan gathered in Orlando, FL March 27-28 to participate in a workshop with Guo Juan 5P, a top pro and founder of the Guo Juan Internet Go School. The workshop consisted of sessions that were divided into two groups — 5d-3k and 4k-10k — as well as combined sessions. These included lectures, exercises, games, and game reviews, predominantly covering “Common Mistakes” and emphasizing mid-game fighting. In addition to in-depth study, there were fun activities such as a spelling-bee style elimination team go game and an outdoor simul with Guo Juan on a beautiful sunny Sunday morning. Attending players came from all over Florida, including Sarasota, Miami, Orlando, Gainesville, Jacksonville, and Merritt Island, many seeking to hone their skills for the annual Orlando Go Tournament, to be held May 8-9 at the University of Central Florida. The workshop was organized by Joshua Lee (4d), head of Go Orlando chapter of the AGA. Top California youth face off in the Bay Area High School Go Tournament on April 25th. The AGF and the Bay Area Go Players Association (BAGPA) are co-sponsoring the event, which was almost canceled after losing Ing funding last year. Enterprising teen organizer David Su has fought to keep the event going, securing funding from the AGF and taking responsibility for organizing the event. Nine schools have entered, some with several three-person teams. Late entries will still be accepted says Su; more info and the entry form are on the BAGPA website. Sixteen young players won entry into next week’s World Youth Go Championship (WYGC) Qualifier finals, where they will join Calvin Sun 7d and Ben Lockhart 5d for an 18-player single-elimination tournament. Thirty two youth competed in the online WYGC Qualifier last weekend, with competition fierce in all brackets. In the junior division, Aaron Ye 1d led the field with four wins. The senior division was dominated by Curtis Tang 8d, and Zhongxia Zhao 7d, who won all four games. Several kyu players entered for the chance to play top ranked youth, and dan players gave their kyu opponents game reviews after each match. The finals will be held on April 10-11 in the KGS AGA Tournaments room, with matches at 9a and 1p Pacific time. Click here for full Qualifier results. The East Coast summer go camp is set for July 17-25, in Somerset, New Jersey, while the West Coast Go Camp is still seeking a Director. Feng Yun 9P will again be the primary teacher at the East Coast camp, with John Mangual taking over as camp director. “The camps have been popular with young players on both Coasts,” said AGA President Allan Abramson, “and we’re looking for someone to organize and run this year’s camp on the West Coast.” Those interested can contact Abramson at President@usgo.org. The AGF is offering partial scholarships to the camps, and USYGC finalists are eligible for a pool of 16 camp scholarships as well. Click here for more information and an application.